The Crystal Serenity will depart Los Angeles on January 13, 2019, and will arrive in Monte Carlo on April 7. With nearly three years advanced confirmation, Crystal® unveils its 2019 Grand Continental Odysseys World Cruise, a magnificent 84-day exploration of Australia and Africa by way of the South Pacific and Indian Ocean. ​Amidst the supreme luxuries and all-inclusive amenities of Crystal Serenity®, wildlife aficionados will thrill to the discovery of Outback adventures and Big Five safaris, snorkel and dive excursions from Hawaii and Fiji to Mauritius and Madagascar, desert excursions in Namibia, Green Turtle hatcheries in Ascension and mountain treks in Cape Verde Islands. Visiting 34 ports of call in 20 countries, this majestic homage to our beautiful world features four maiden calls, overnights in Sydney and Auckland, and three-day stays in Cape Town and Monte Carlo. 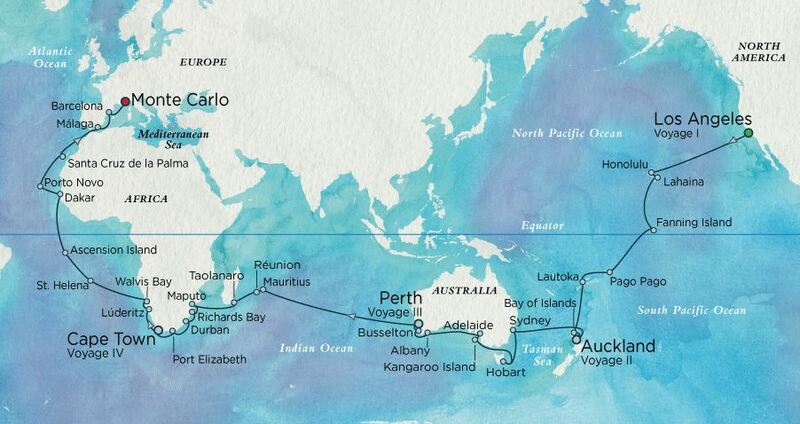 If your you can't sneak away for the full World Cruise, they can consider one of four shorter segments, each a microcosm of World Cruise grandeur with a sensational destination focus—Hawaii & the South Pacific; Australia & Tasmania; Indian Ocean & South Africa; Western Africa & Mediterranean.